True Skate successfully recreates the open-ended fun of freely skating in an empty skate park. Like many, I was swept up in the craze that was Tony Hawk's Pro Skater on the PlayStation. From the very first time I successfully landed a kick-flip, I was hooked. Years later, I'm experiencing much of the same feelings I had then, but in a completely new game called True Skate. True Skate successfully recreates the fun of riding a skateboard in an open park, doing whatever I want -- and feeling like I can do anything -- right on the iPhone. 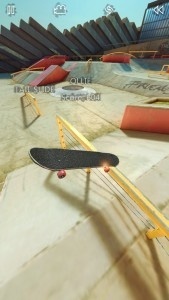 True Skate opens by taking the user through a short tutorial, showing players the basics of moving around, maneuvering the board and perfecting the art of "ollieing" -- basically, striking the tail of the board against the ground to get it to skip into the air while riding it. Moving around and doing tricks feels intuitive and natural. Simply swipe along the ground to move forward, then swipe left or right to steer the board in those directions. Swipe backwards to tilt the board until the tail pops off the ground, then tap forward to level it out, almost just like doing an ollie on a real board. It's simple, but takes a lot of practice to perfect the skill. After completing the tutorial, the game is whatever the player makes of it. As good looking and open as it is, True Skate simply lacks depth of gameplay. Most of it revolves around missions that have the player doing certain tricks in certain areas to be rated on how well they do. Then there's "Follow the Leader," which is more of the same, but with multiple tricks to be done while following a shadow board to see where it goes and what it does next. True Skate a very "sandboxy" game that remains true to the core of skating, which is, freedom. The player can do whatever they want, skate to their heart's content doing missions, practicing tricks or just skating around, having fun. Aside from being light on actual gaming experiences, another downside is that there's only one skate park to choose from. Packed with rails to grind, ramps to jump off of and plenty of other things to do, the variety is nice, but it feels cramped. Hopefully, some extra parks are in the works. Overall, True Skate is a stunningly good looking game that comes incredibly close to recreating the feel of real skateboarding. There might not be a lot to do, but it does provide for a good time. Review disclosure: note that the product reviewed on this page may have been provided to us by the developer for the purposes of this review. Note that if the developer provides the product or not, this does not impact the review or score.